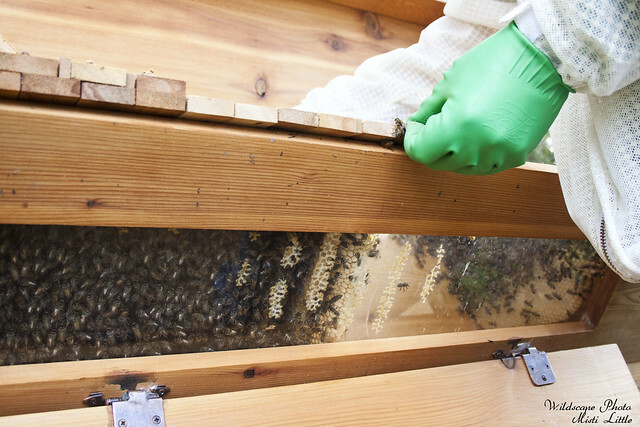 It had been several months, really since we harvested honey that we’ve done any kind of good hive inspection. We’ve been in the hive a couple of times for small checks, but this time we needed to look to see if small hive beetle had completely taken over the combs and were hatching larvae. It could have been disastrous, losing our entire hive—they would just up and leave because the beetles might have been too much to handle. Over the last two months I had been hoping that the bees would have put on several more combs of honey for winter and they haven’t. The hive split sometime in early August and since then it has seemed as if the hive was in some kind of homeostasis, just living but not really thriving. We’d first noticed the beetles when we harvested honey but they weren’t too bad yet. I got in the hive sometime in August to put in some beetle traps that Chris had bought and I noticed there were vastly more than before. 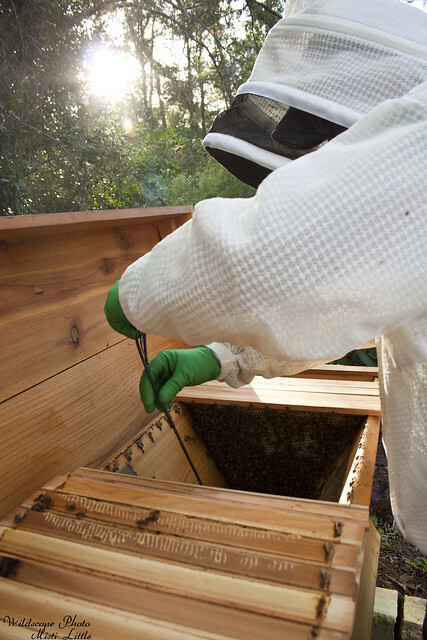 This weekend we needed to get around the hive to weed and put in decomposed granite for our garden pathways and after having been stung by a bee on my nose near the corner of my eye, I’ve been much more hesitant to do work around the hive without a suit on. We were planning on plugging up the entrance to the hive last night so we could get everything done but the bees were slow in returning home after dark. I waited upstairs for awhile and Chris finally came in much later to say that he thought we needed to get in the hive because it seemed that maybe we were having a bigger problem with the bees than we thought. Tonight we opened it up and started squishing hive beetles as we saw them. 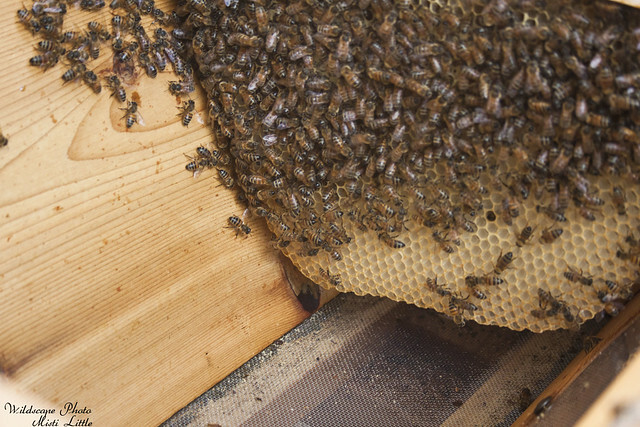 The bees have only put on about a quarter of a new comb and have started lining two other bars with wax, so that seemed promising, or at least not as despondent as I was thinking. The beetles were definitely around the first three to four combs and their amounts decreased as we worked our way further back in the hive. That’s good. However, Chris thought he saw larvae in one of the combs and as much as I tried to look I couldn’t see anything. So, that’s not good. 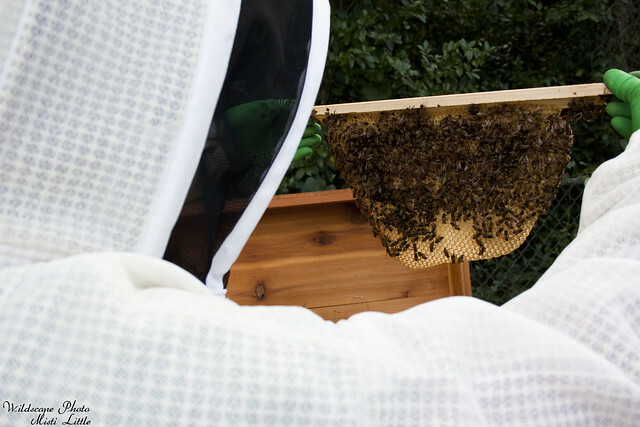 We’re looking at trying to get this problem under control so we don’t lose our hive. 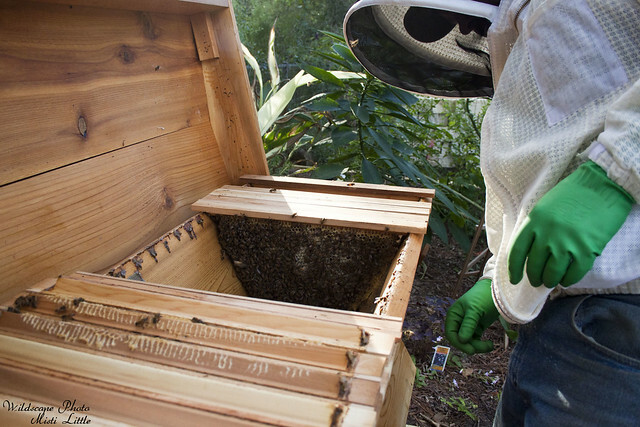 It is possible we will have to move our hive out of the garden, too. It is a bit shady, around moisture (the sprinklers), which assists in attracting the hive beetles. 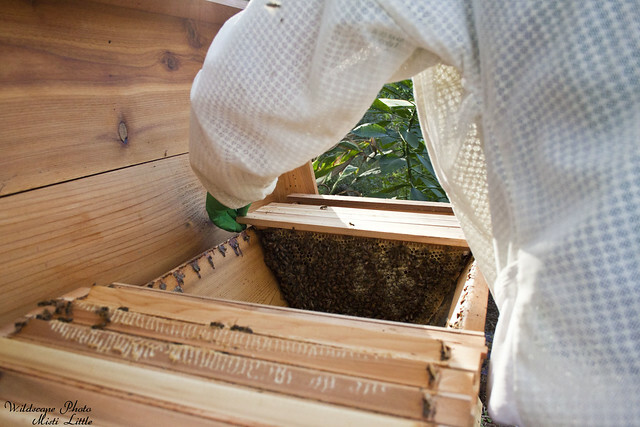 But moving a hive isn’t easy. You can move it three feet or three miles but anything else will create chaos and bees who can’t find their way home. We might have to temporarily move it elsewhere and then bring it back to the house after the bees are adjusted and put it in a less shady and moisture prone area. Maybe. That’s a last resort fix at the moment. The fall blooming flow is on, so let’s hope they can knock out a couple of combs before the first frost. Ugh, as if bees don’t have enough problems. Lousy beetles. Good luck in your battle to defend the hive. I hope things turn out okay with them!